The City of Placerville welcomes new businesses to the area and values the established businesses that have kept Placerville's economy vibrant over the years.Per the City code, every enterprise doing business within the City limits must have a valid business license. City Municipal Code 5-1-4 states, "It shall be unlawful for any person to transact and carry on any business, trade, profession, calling, or occupation in the City without first having procured a license from said City so to do and paying the tax hereinafter prescribed or without complying with any and all applicable provisions of this chapter." The State Board of Equalization notifies the City of Placerville when person(s) are conducting business within the City limits. The City requires business owners to complete the Business Tax Certificate Application prior to conducting business. This includes person(s) conducting business out of their home within the City limits, which requires a completed Home Occupation Form in addition to the Business Tax Certificate Application. Certain businesses such as solicitors, itinerant merchants, Christmas tree/harvest product sales, flea markets and taxicabs require special provisions and must complete an attachment in addition to the Business Tax Certificate Application. Non-profit organizations are required to file a business license which is available at no charge with completed Form 5013C Non-Profit Statement of Non-Profit Status. If you have purchased an existing business, licenses are non-transferable, and the new owner(s) must file with the City. It is important to note that El Dorado County Business Licenses are not valid for use within the City limits. The City's Business License year encompasses the period of September 1st to August 31st, and the license tax is levied on September 1st of each year. Renewal notices are mailed to business in early August, and the license tax is due on September 1st. A penalty will be assessed to any business that fails to renew their licenses by the due date. To view the Business License Tax Schedule, click here . Certain categories of business are subject to specific business tax rates. Businesses located in the City's downtown area up to the 601 Block of Main Street are levied the Downtown Business Improvement Tax which is collected by the City in trust for the Placerville Downtown Association. 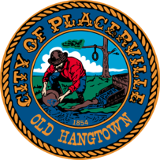 The Business Improvement Taxes are used to improve and enhance the downtown area at the discretion of the Placerville Downtown Association. Enterprises that begin doing business after November 30th, will be levied a prorated amount of business tax on a quarterly basis. If the status of a business changes (e.g., type of business, address, ownership, etc. ), the business must complete a Business Tax Update Form. Would you like a list of established businesses located in the City limits? A list of businesses is available for $10.00 per list. Please allow for a minimum of a one-day turn around for business list requests. Please be sure to post your Business License Certificate in a conspicuous place. Thank you!